Whilst TMR mixing wagons have their place in high production feedlots, where the cattle spend their entire life feeding on a ration and the mix is dialed up to the limits. However, for a lot farms around the world, they pose a safety risk and consume too much labour and fuel. Often their operational costs far outweigh the benefits that are being utilised. Unique to Hustler's Comby Feeders, is the load dividing system whereby slow moving, hydraulically powered floors move on demand. This gives Fraser the ability to mix his feeds, by first layering grass silage, then the Maize silage in the next layer and then other products on top of that. So when each floor has activated a portion of each layer (depending on the thickness) is mixed and fed by the side delivery elevator. Fraser found the Comby could mix the ration more than adequately for the nutritional requirements of his herd. To compare the time it takes for a TMR to get the mix good enough, there are some good savings to be achieved. The layering method is nothing new. From previous experience, they'd tried to utilise the layering method with a conventional silage wagon but it wasn't much of a success. Because the floors were continuously working, the bottom layer would get stripped out of the load and the mix would start highly concentrated, and end highly diluted. With the Comby, thanks to each floor being operated on demand. The mix delivered in the windrow resulted in a marked improvement in feed consistency throughout the entire load. And by using a bar/chain elevator on the Comby Feeders, the different feeds are blended together. Previously there hasn't been many options for farmers who want a machine that can feed out anything. 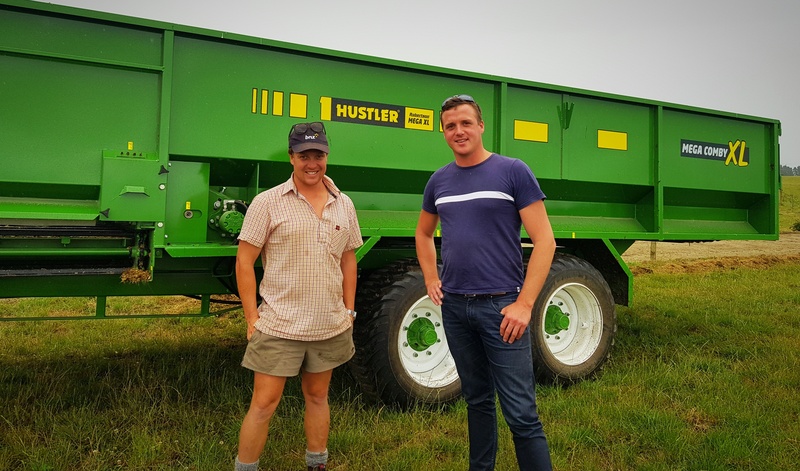 Be it bales, silage, food waste or any other kind of supplementary feeds, and neither for farmers who want a more cost-effective solution for feeding a blended feed to their cattle.